With enterprise rapidly becoming virtual – by way of the cloud and connecting with IoT, physical servers for Data Centers are on their way out. Whatever the storage capabilities, it is just not going to work for the enterprise of today, and definitely not for tomorrow. What then is the face of Data Centers 2.0? The cloud has all but taken over the storage scenario if Gartner’s figures are to be believed. In fact, in India, the revenue from cloud services has been projected at 33.2% between 2012 and 2017. So essentially, the cloud expenditure will grow at a higher rate than IT budgets in most organisations. Given this reality, and coupled with the rapid adoption and growth of virtualisation as an enterprise technology, the future of Data Centers is going to be vastly different from its present avatar. Businesses are demanding a change. Virtualization is the enabling technology for a whole new wave of IT innovation. In addition to the technological prerogative, virtualisation is a technology that will drive efficiency and speed in enterprise in more ways than one, the primary one being business advantage. There will be soon no reason why any company would entertain the monolithic hardware based data centers that grab higher slice of the IT budget pie in just keeping it efficient and well managed. The most obvious way the change will happen is the transformation from everything hardware to everything on a software platform. Beyond storage, even the Data Center networks! So SDDC is the way forward, definitely. According to a study by MarketsandMarkets, the market for Software Defined Data Centers will be growing at a rate of 28.8% every year between 2015 and 2020, from USD 21.78 billion in 2015, touching USD 78 Billion in 2020. With the irresistible benefits of reduced IT infra cost that the automation provides, and the resultant efficiency of market response, SDDC is definitely the hero of the still evolving Data Center industry. With software enabled systems, a multi layered control is the next easy step. A centralised data center management console is now a reality and this also allows the analytics and big data processes to get more space, visibility and hence, strategic leverage. These layers can control almost everything – from users, space, virtual machines and even manage policies. With higher visibility into every single aspect of the data that can be drawn, and more efficient process control, this will certainly be a part of the Data Center of the near future. With software essentially taking over Data Centers, they will be completely infrastructure agnostic very soon. There will be very little consideration of which hypervisor, servers or platform is being used, since the layered management tools will make it so easy for administrators to scale and work on powerful platforms, in a much more fluid and seamless fashion. The Data Center of tomorrow will take ease of management to hitherto unknown levels. In the same flow, Data Center automation will ensure better workflow management and optimal efficiency management as well. Robotics will almost certainly be utilised to a greater extent in efficiently managing Data Centers of tomorrow. Many known brands are already developing smaller robots that will help in identifying the energy patterns and their efficacy in Data Centers, and this will only get better over the next few years as Robotics becomes a more enterprise oriented technology. However, just acquiring a Software Defined Data Center may not be the end of enterprise planning; there are certain things to watch out for, while taking up this innovative plan. Firstly, SDDC is not an enterprise reality yet, and only those organisations that have a certain maturity levels in terms of I&O engineering, are best off installing it. Secondly, and more importantly, adoption of a software defined data center should come from a business need for higher agility and scalability. The underlying technology and skill requirements will not be viable if this is a purely technology initiative. In any case, this is not an off the shelf product and any enterprise planning to install has to do its own due diligence. A SDDC initiative would need that the organizations identify a suitable vendor to do the job, and do it well. Then, there are discussions around the various components of the Data Center- which may not all come from the same vendor- hence the issue of integration and seamless interoperability will arise. Till it becomes commonplace technology, the stakeholders need to work on various commercial aspects of the transaction – software lock- in will be a big issue for this particular decision, and could play a very strategic role in the financial planning. All said, the SDDC will replace your Data center eventually, over the next two to three years, but it may not be the smartest choice for every enterprise right away. However, enterprises need to be prepared for the change when it comes- because then it will be too late to start preparedness and planning. 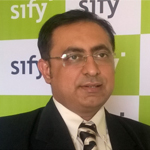 Associate Vice President – Data Center Transformation, Sify Technologies Limited. Himanshu is a senior executive with more than 2 decades of exposure in IT Infrastructure and Data center Transformation Business. Himanshu has worked internationally on large system Integration and DC Transformation deals in companies like HP, HCL Technologies & Tech Mahindra and has authored numerous article on IT Transformation and Modernization.